Shining Sakura sitting next to a very cute Kiki from Kiki's Delivery Service. Shining Sakura hand made her Catheana dress with many different techniques. Fabric Selection: I made most of Catheana's dress with 95% cotton 5% spandex lightweight material. I chose this material because it would stretch around me, be breathable, and I could dye it. There are at least six layers on every part so heat was going to be an issue; lightweight and breathable material was a must. 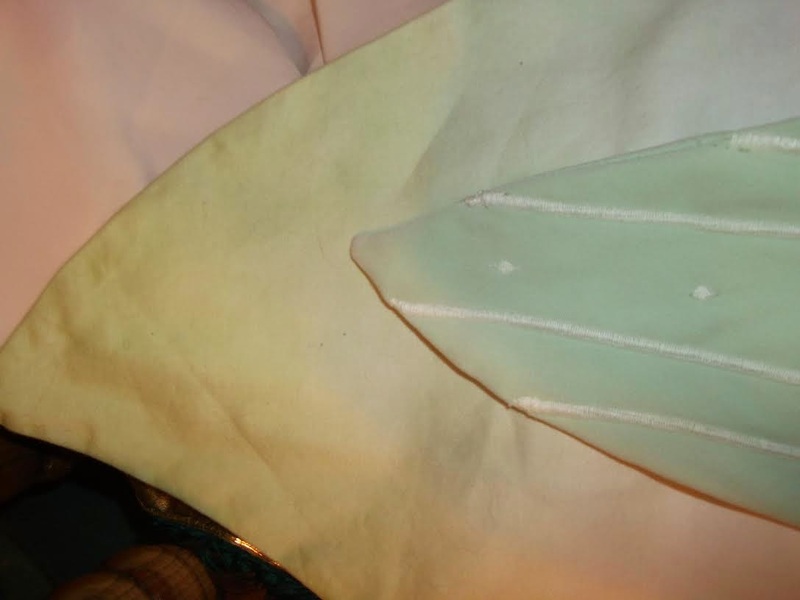 The fabric also has a real nice sheen to it that gives it a slight silk like appearance. Note how she selected the fabric knowing her dress would have many layers and could get very warm. 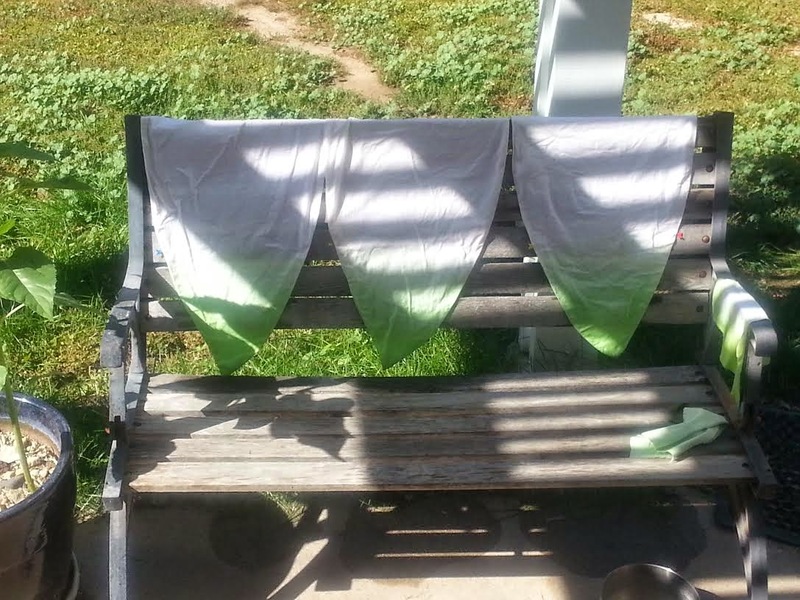 Dying the Fabric: I ombré dyed the bottom of the skirt a nice light green after immersion dying the whole material creme. 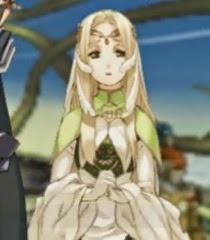 This gave the material that white with a creamy shadow effect that her artwork had. 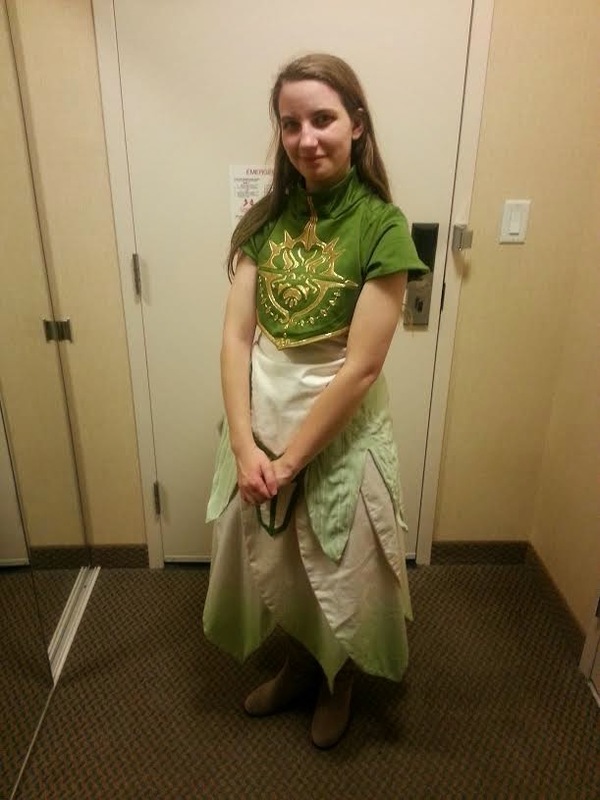 I got a jade green fabric for the rest of the outfit out of the same material for the top and designs on the front piece. The leaf like skirt and over jacket at the top is made from a synthetic stretchy material, similar in feel to faux suede and velvet, I wanted a nice change in overall texture in the outfit other than shiny and the faux suede would be soft near my neck and wouldn't bother me. bottom of the skirt pieces drying here. Ombré dying is a method dying that creates a gradient of color from darker to lighter in the material. It is very tricky and takes patience to do. You have to dip the fabric into the dye solution multiple time. It is also known as "dip dying." Immersion dying is when you place the entire fabric in the dye and stir it over a length of time. 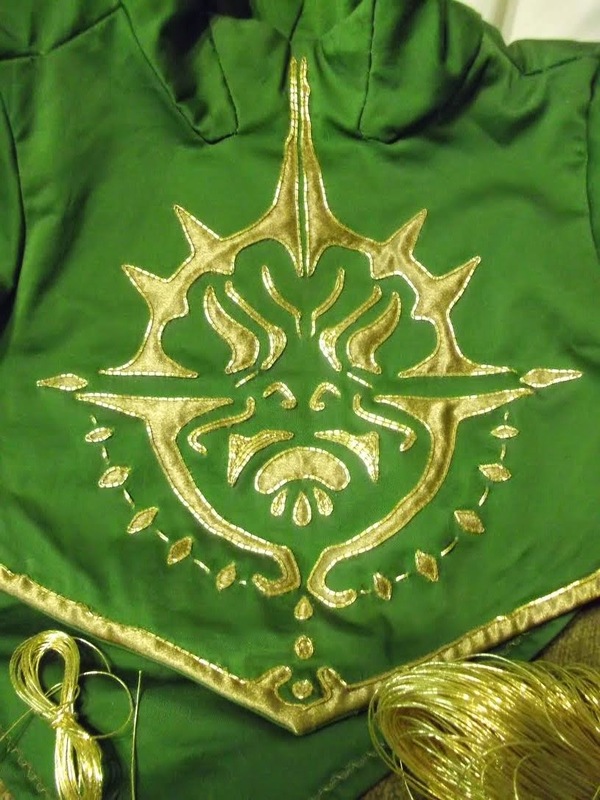 Embroidery: I machine embroidered the leaf designs with a slightly lighter color thread, and the top jacket was detailed with antique color gold fabric and gold thread. Any gold parts of the outfit were super enlarged from the art book references at least 500X and fixed by hand onto paper to make the pattern from afterwards. The gold fabric is a synthetic Charmeuse Satin backed with interfacing. The interfacing was used to keep the individual threads that make up the unique multi-layered fabric from falling apart since they were small designs. The thread is real Japanese thread couched into the edges of the gold to lighten the gold colors up and to give the pattern a nice smooth border. This is where VFire references a lot of stitches for embroidery. The gold also had a unique property which I found out while sewing; even if no light is directly falling onto it, ANY amount light in a room will, even from behind, cause it to sort of glow. Not glow in the dark, but to shine and show up as if it had light shining on it. This quality would ensure it would show up even on stage in a darker area so people wouldn't miss out on the samurai-esque design. The thread was purchased on eBay auction from Japan. Example of couching work and embroidery. 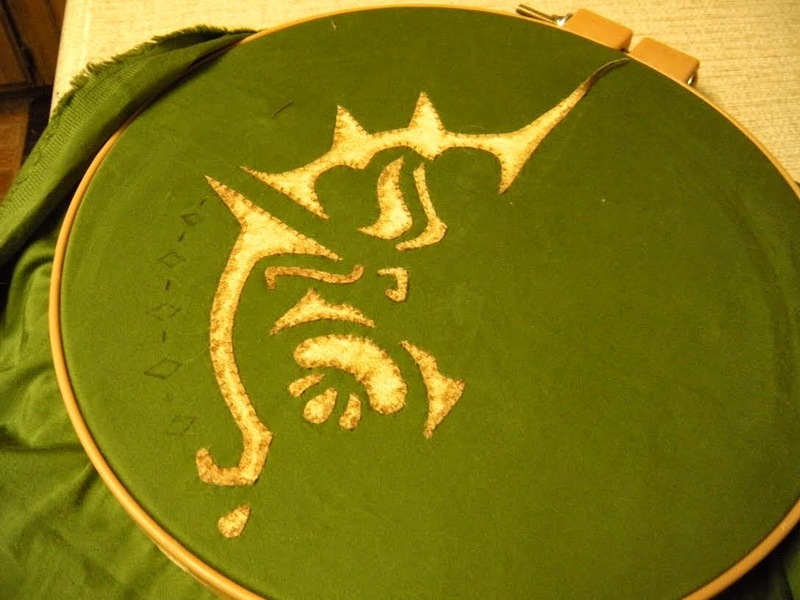 The mask was first cut out in the gold fabric with the edges finished with No-Fray. I then transferred it onto the green fabric. I hand sewed the design on, then applied the gold couching, leaving some areas filled in, and others only outlined to emphasize the samurai mask reference. Doing this also made it so the pattern popped out instead of hide when all filled in. While sewing the mask, it was put on a 12x12 hoop frame with inner locking parts to keep it from sliding around or popping out. The ends of the gold thread are quite thick and needed assistance with forceps to plunge it through the fabric to finish it off. 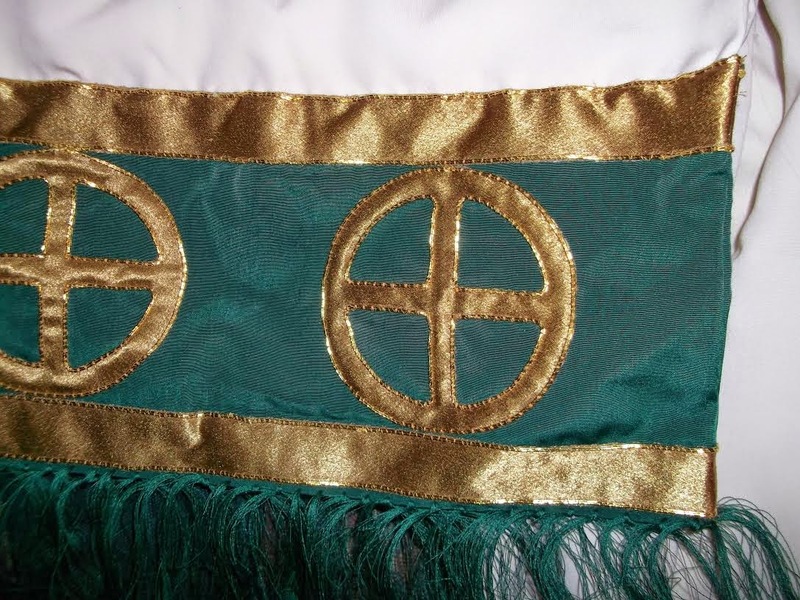 The green fabric was also stabilized with interfacing to keep it straight as the fabric does stretch quite a bit. I wanted a smooth non rippled design once finished. 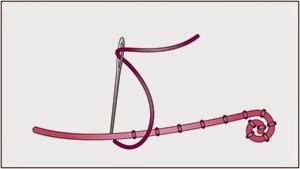 The Scarf: The designs on the scarf are done the same way, with an exception to the straight parts. They were couched in by machine VERY SLOWLY due to time and sanity constraints. The fringes on the ends of the scarf are two spools of Guterman all purpose thread. I took a mac and cheese box lying around, wound it around twenty times per tassel, cut, then sewed them all in at once, then tied it off. in total there about ninety of the tassels that make up the fringe, though I will most likely add two times more to make it look more full later. The fringe at the end are hand made tassles!! The material used in the scarf is peachskin in both cream and dark green. About two to three yards are used in the creme part alone. No altering or anything, just folded the fabric in half, sewed it up on the inside, and folded it again so it would look like an over sized pencil case style pocket. 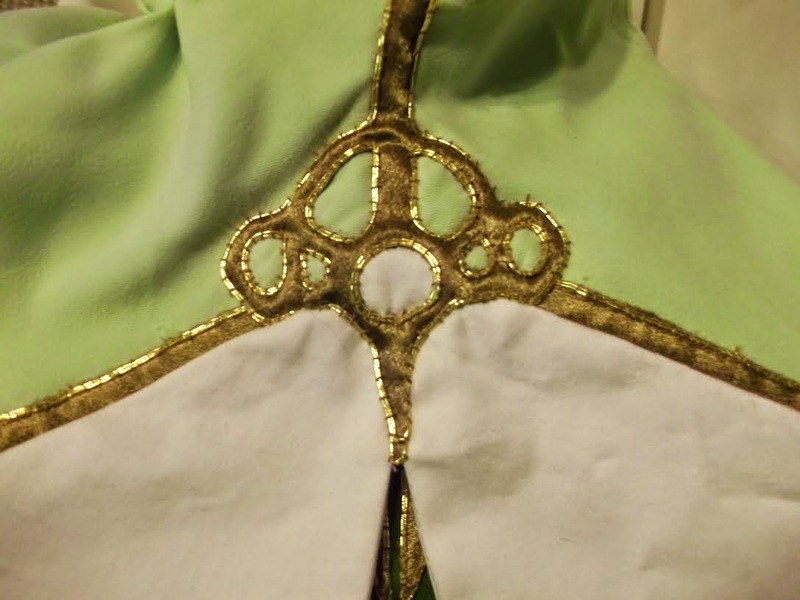 Then I attached the ends with the green fabric once the gold embroidery was done. The scarf weighs about five pounds, give or take a pound. The character design specifically called for this full and flowing, and I did try using half the fabric to it wouldn't be so heavy. It honestly just didn't look like the art book reference, and seemed quite limp, so I cut another piece the right length and used the whole yardage. This gave it the full and flowing look I needed. Gloves: The gloves are matte spandex of some sort, very lightweight... if not too much so, and were hand made with machine using a slightly larger version of my hand and arm pattern. Sakura test fitting the costume. Petticoat and bustle: The petticoat is made of nice bed sheet cotton (quite worn, old, and SOFT as ever) and five yards creme tulle. I sewed a long length of fabric and made a loop for the elastic. I left the edges so I could easily slide it in the front for easy sitting and bathroom purposes. (I found out historically petticoats were not skirt style, but more like a Hakama with a tie style for those reasons) I also made the bustle from sheer synthetic fabric with some visible waves to it to make it look more historically accurate and neat looking. I got two yards, scrunched up half, tied it with a rubber band, then attached that to the elastic so it would move up or down with me and I could position it later or during wear. It could also be reused if I find a better use for it in the future. I like how Shining Sakura looked into historic version of the petticoat and bustle for better accuracy as well as comfort in design. Leggings and Boots: I used cream colored leggings instead of tights for better warmth and reuse ability. The boots I bought from china... no more to be said, I was upset with the lied about order. will be eventually replaced. Circlet Crown: The circlet crown is made from two sheets of Wonderflex stuck together by itself. I used hot bath water to shape and connect the pieces and then used a sharpie to draw out my designs. I cut out the pattern with scissors and a utility knife. After that I placed it on a manikin head, used the head to help the crown, and then put a generous amount of fine wood filler on top. This was to make it as smooth as possible within time constraints and fill in gaps. I choose this method for its flexibility, ease of sanding, and somewhat quick dry time. Wonderflex is a plastic that can be heated and shaped. When it cools it holds the shape that you give to it. It also has its own glue as part of its material so it sticks to itself when heated as well. Then I sanded, primed, sanded, primed, and finally spray painted with gold and a clear coat mixture. (sprayed both/every other at the same time) This gave it a nice looking color and textured look. I finished off with clear coat to help it not look like fake gold. I used gold chain that I had lying around for the front part and attached the red dyed, howlite teardrop stone with fishing line onto the crown. Wig: The wig was bought online. I was sent the wrong wig but I managed to make it work. I worked with the bangs in front to look like a no bang, front part wig by hiding the bangs behind my ears and using the crown to hold them in place. 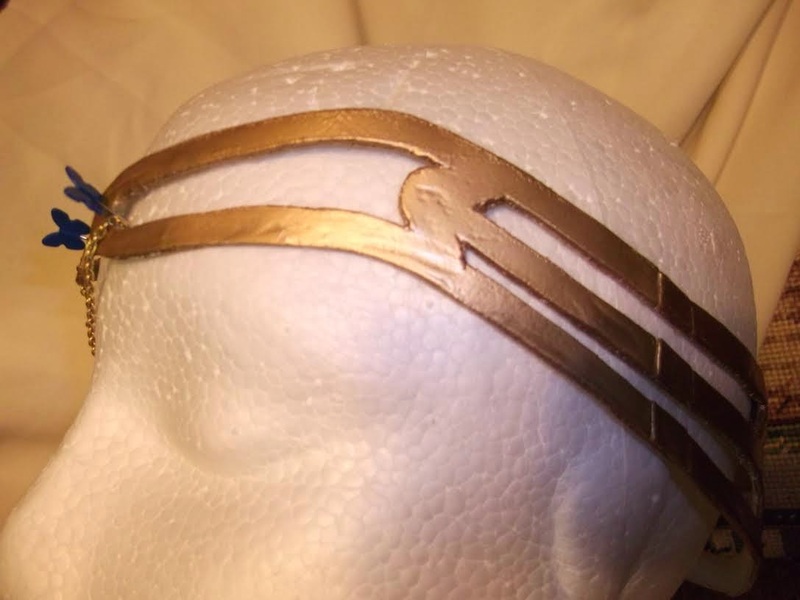 The feathers are attached via a wig clip under the circlet, it also helps hide the bangs and transitions and keeps the crown from rubbing against my ears. The end! All in all this took over two months to make, staying up till two AM most nights. It took more hours than I would want to know about or count and cost somewhere between $220-250. This makes Catheana my most expensive and time consuming project yet!! UGHHHH....... did't expect some parts not working out... and didn't realize the cost till I added it all up just now... good news was I had half already purchased long ago. Hurray for learning projects!! 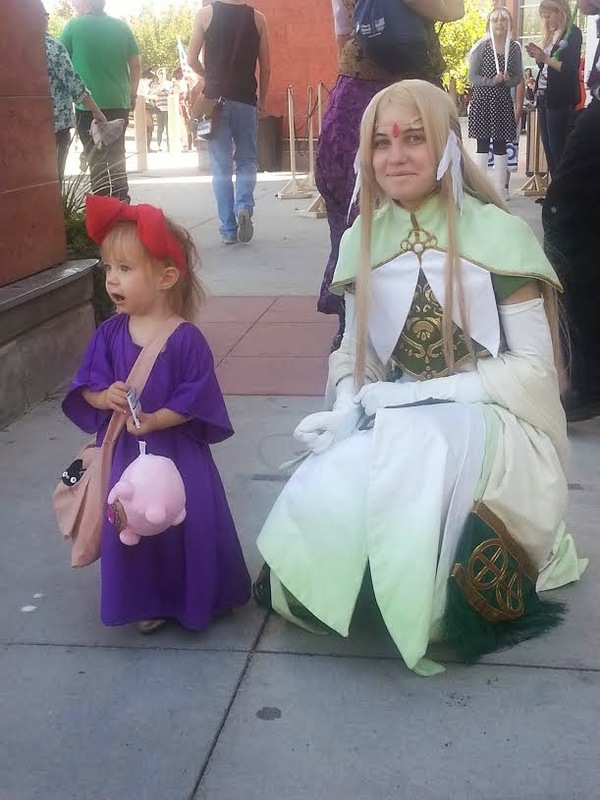 My goals with this outfit was to learn new sewing techniques, make it as close to historically accurate as I could, try out more dying projects, and to have fun.... and not stay up till the night before the contest. Did all but one of the goals better than I could have imagined!